NASA’s TESS Mission launched last March and began returning data in the fall. As the worthy successor to the wildly successful Kepler Mission, TESS promises great things. And already some of that promise is being fulfilled. Astronomers have used TESS data to find exocomets, probe the atmospheres of planets we already knew about, and most recently to find possible evidence for imminent planetary destruction. The possibly doomed planet is WASP-4b, a gas giant planet that passes in front of its host star every 1.5 days. It orbits so close to its host star that tidal interactions between the star and planet can cause the shape of orbit to vary over time, giving rise to transit-timing variations, illustrated in the video below. Just this week, Luke Bouma, a graduate student in Princeton astronomy, and colleagues analyzed recent TESS observations of WASP-4b to see if the data show any signs of orbital variations. Not only did they find signs of orbital variation, they found that the orbital period seems to be getting shorter, at a rate of about 12 milliseconds per year, or about one jiffy every year. This about 1000 times faster than slowing of the Earth’s day due to tidal interactions with the Moon. Variation in WASP-4b’s orbital period as reported in Bouma et al. (2019). It’s not clear exactly what is causing WASP-4b’s orbit to change, and Bouma explores a couple of options. One idea is that WASP-4b’s orbit is very slightly eccentric and that tidal interactions between the planet and star may be causing apsidal precession, similar to effects experienced by the Moon that complicate the timing of eclipses. Another, and to my mind more exciting, possibility is that tidal interactions with the host star are drawing the planet inexorably inward. In that case, WASP-4b may eventually be torn apart by its host star’s gravity, a fate that may have befallen many a hot Jupiter. The great thing about both hypotheses is that they can be tested by additional observations. In fact, amateur astronomers may be able to contribute. Indeed, there is a cottage industry of amateur astronomers observing exoplanet transits, and the hardware, software, and expertise required are pretty minimal for serious amateurs. Predicted orbital period variations (in minutes) going into the future from Bouma et al. (2019). Bouma predicts that, over the next several years, WASP-4b’s orbital period might change by several minutes. If the period drops and then increases again (orange curves above), then the variations are likely due to precession, and the planet is probably safe against tidal decay. However, if the period continues to drop (blue curves above), then the planet is likely doomed to tidal disruption in the next nine million years, short on cosmic timescales. Posted in: BSU Journal Club. Tagged: hubble space telescope, Neptune. 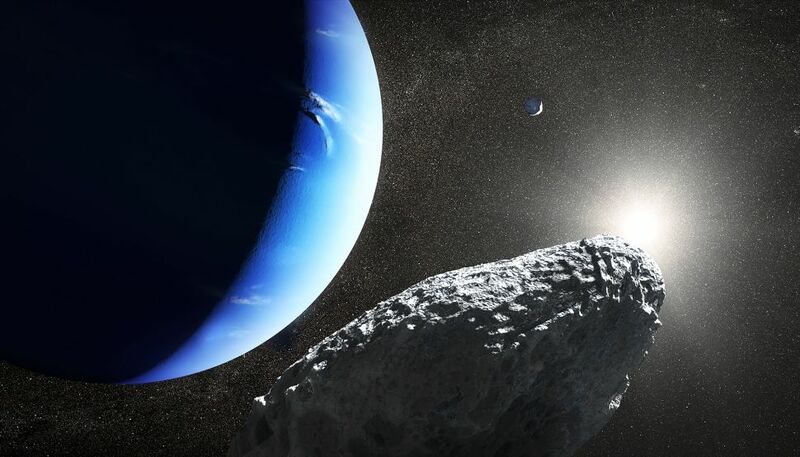 Artist’s conception of Neptune’s newest moon Hippocamp. In our research group meeting this week, we discussed the recent discovery of a new moon orbiting Neptune, named after Poseidon’s chimerical winged pega-fish Hippocamp. Hippocamp is about 12 km across, so small and dim that it wasn’t seen when Voyager 2 flew past in 1989, back when the B-52s were heading down the Atlanta Highway. In fact, Showalter and colleagues had to use high-precision Hubble observations and a new data-processing approach to spot the little moon circling Neptune just interior to another moon Proteus. Hippocamp orbits so close to Proteus that Showalter and colleagues suggest it may have originated from this larger moon in a massive collision. That same collision may have created Proteus’ enormous impact basin Pharos, and Showalter suggests that collision would have liberated debris, some of which later accreted interior to Proteus’ orbit to form Hippocamp. If Hippocamp really did form from such an impact, it has probably experienced numerous disruptive collisions itself over its billion year history. Based on studies of the frequency of large cometary collisions out near Neptune’s orbit, Showalter and colleagues estimate that Hippocamp may have been disrupted and re-accreted about 9 times in the last 4 billion years. Having risen from its own ashes so many times, Hippocamp may be less like a mythical sea-horse and more like a cynthian phoenix. Posted in: Public Outreach. Tagged: aerospace day. Posted in: BSU Journal Club. Tagged: atmospheric escape, hubble, transiting planets, WASP-107b. 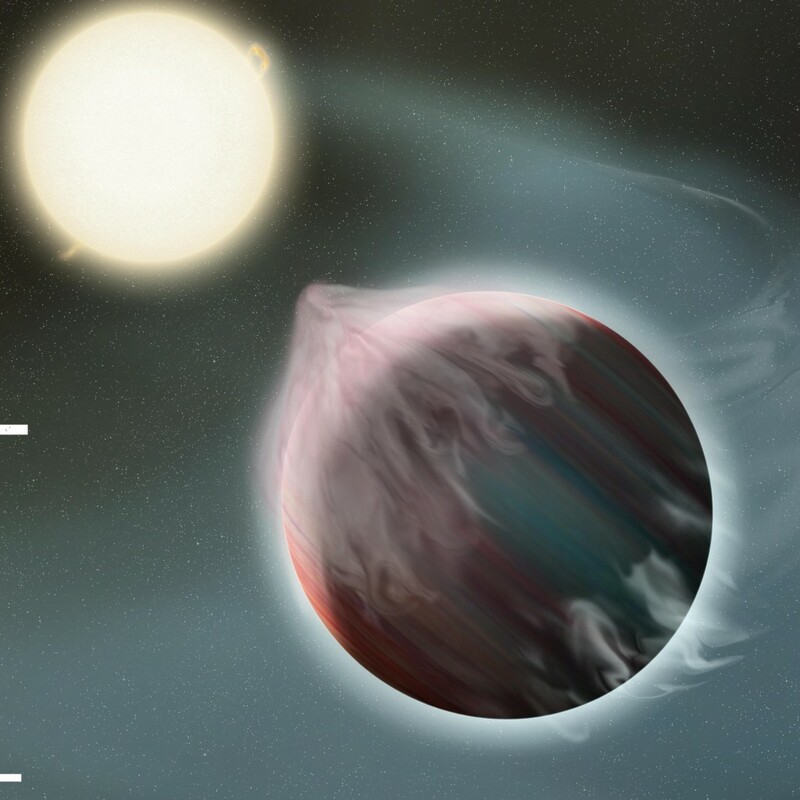 Artist’s conception of a hot Jupiter shedding mass. The very first exoplanet discovered around a Sun-like star, 51 Peg b, was a shocker – it’s a giant planet like Jupiter made mostly of hydrogen and helium but 100 times closer to its sun than Jupiter is to ours and whizzes around its orbit every 4 days. Indeed, when its discoverers Michel Mayor and Didier Queloz first spotted the telltale spectral wobble of a planet in a 4-day orbit, they didn’t believe their discovery. At the time, everyone knew (or thought they knew) that planets like Jupiter could only form very far away from their host star. Worse, so close to its star, 51 Peg b’s was being super-heated, and Mayor and Queloz worried that such a hot gas giant might quickly lose its hot, bloated atmosphere. And in their discovery paper, they suggested that the giant planet we see today as 51 Peg b might have started out as a brown dwarfthat shed trillions and trillions of lbs. Later studies showed those early concerns about atmospheric blow-off were overblown and planets as massive as 51 Peg b, even if they are as scorched, probably can’t lose more than a fraction of their original mass. Since then, hot Jupiters like 51 Peg b, while cosmically rare, have become a fairly common type of exoplanet discovery. Artist’s conception of WASP-107b transiting its host star. Sing and colleagues collected transit observations in infrared wavelengths of the WASP-107 system using the venerable Hubble Space Telescope. By looking in the infrared, they could search for the spectral signals of different gases in WASP-107b’s atmosphere. WASP-107b is an especially good target for atmospheric characterization because its host star is very bright (compared to other planet hosts) and the planet itself is very low density – it has a mass a tenth that of Jupiter’s but a radius almost as big, giving the planet a density comparable to wind-packed snow. With such a low density, WASP-107b’s atmosphere is puffy and distended, which means that its atmospheric gases can easily imprint their spectral signatures on the light observed by Hubble, making them easy to detect. And for the first time in any exoplanet, Sing and colleagues saw signs of helium gas in WASP-107b’s atmospheric spectrum. In fact, the helium signal they saw was so whopping big that it suggests WASP-107b’s atmosphere is actively escaping, at a rate of about 10,000 tons per second. Escape of WASP-107b’s atmosphere. The planet is the small grey circle near bottom, the star is the yellow circle, and the escaping atmosphere is shown in blue. The black line is the planet’s orbit. From Sing et al. (2018). Even with such a high escape rate, WASP-107b won’t fall apart anytime soon – Sing and colleagues estimate it would only lose about 4% of its mass in a billion years. But as we continue to find more exoplanets, we should probably expect to find more even closer to their host stars with even puffier atmospheres, perhaps some on the verge of being gravitationally ripped apart. So as with 51 Peg b’s discovery, exoplanets are likely to keep challenging our preconceived notions about where planets can and cannot be. Posted in: BSU Journal Club. Tagged: dragonfly mission, Titan. 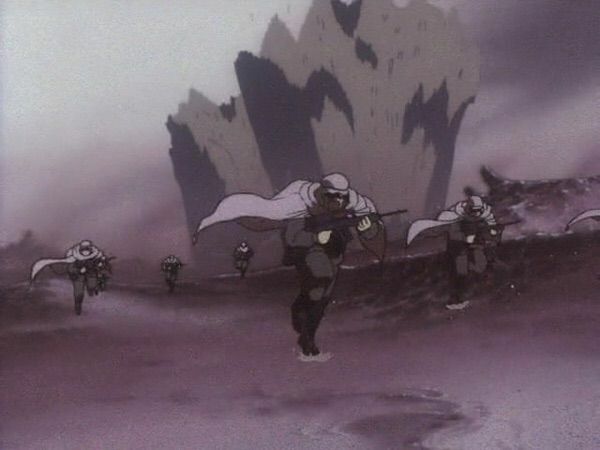 On Cowboy Bebop’s Titan, troops advance across a fictitious dune field that turned out not to be so fictitious. Arguably the best animé of all time, “Cowboy Bebop” is set in a not-too-distant future, when humans inhabit planets and moons across the solar system. In fact, one of the moon inhabited, Saturn’s moon Titan, features as the site of a violent, Desert Storm-like battle among sand dunes and scorpions. “Cowboy Bebop” aired in Japan in 1998-1999, about a year after NASA launched the Cassini-Huygens mission to explore the Saturn system, including Titan. Shortly after arriving at Saturn, Cassini began collecting infrared observations of Titan, allowing scientists to peer through Titan’s hazy atmosphere. They found a surprisingly Earth-like world — violent but irregular storms (albeit of methane and ethane) and vast seas (primarily confined to the poles). Scientists also found expansive dune fields girding the equator. Unlike terrestrial dunes, which are made mostly from silicate grains, these dunes were made (somehow) from carbon- and ice-rich particles. And an even more recent analysis of Cassini observations shows that Titan has something else in common with Earth: large dust storms. 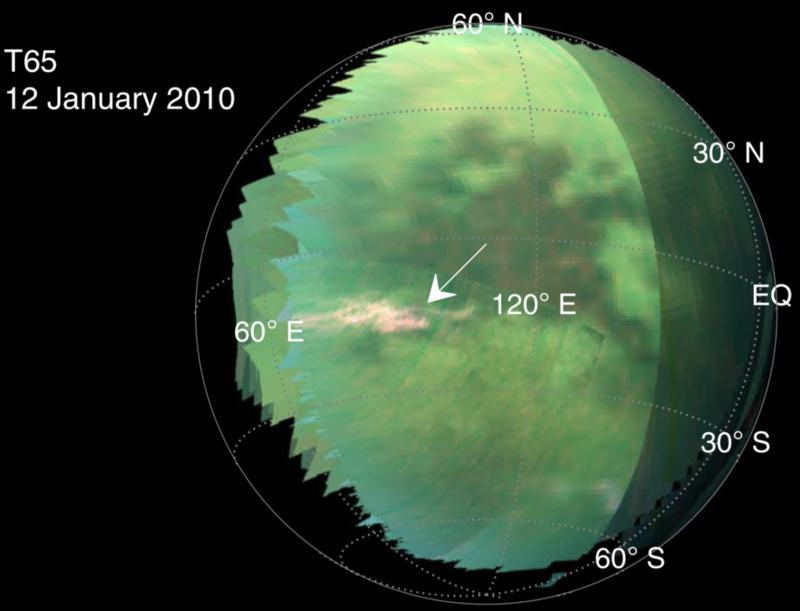 In their study from late last year, Sébastien Rodriguez, an astronomer at the University Paris Diderot, and co-authors looked at maps of Titan collected by Cassini’s VIMS instrument and found that, over the dune regions, a large bright feature appeared and disappeared several times over the course of a few weeks. Figure 1 from Rodriguez et al. (2018) showing the dust storm, indicated by the white arrow. Now, just because there is a bright spot on Titan that changes with time does NOT mean it has to be a dust storm, but Rodriguez and colleagues go to great lengths to show that other explanations don’t fit. For instance, previous observations of Titan found equatorial clouds that produced downpours of methane and ethane on the surface. Superficially, these clouds resembled Rodriguez’s putative dust storms. 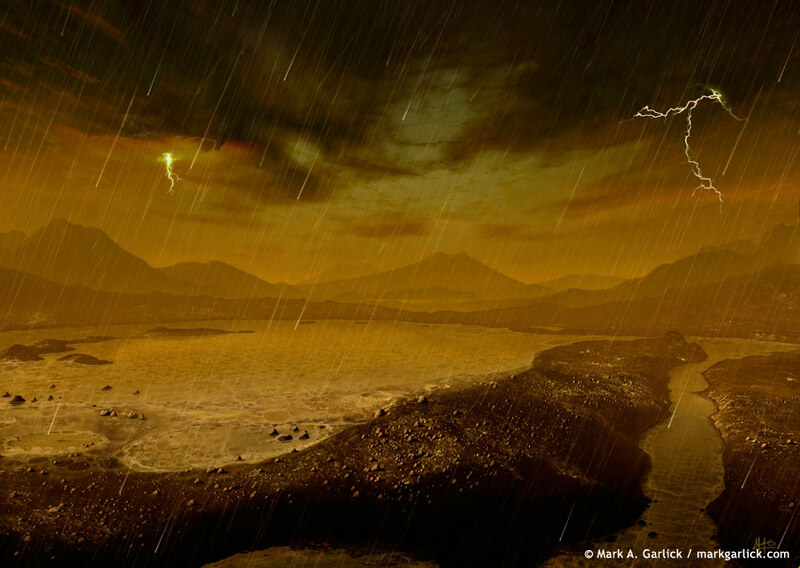 Methane Rain Possible on Titan. From APOD. But Rodriguez’s dust clouds can only be seen in the few wavelengths of infrared light that are known to penetrate Titan’s atmosphere all the way to the ground. Storm clouds can be seen even in wavelengths that don’t reach the ground since they ascend high into the atmosphere. Rodriguez and colleagues are even able to estimate the size of the dust grains — the dust clouds are much easier to see at 5 micron-wavelengths than at the shorter wavelengths that also probe to Titan’s surface. That probably means the grains are about 5 microns. If Titan’s dust really is that small, it’s much smaller than sand grains and even smaller than the dust we usually see on Earth. It turns out that the aerodynamic behavior of a wind-blown particle depends, among other things, on its size. For a planet with a given atmospheric density, winds are good at blowing particles of a specific size — too small and the particles stick together; too big and the wind can’t lift the particles. Rodriguez and colleagues estimate that windspeeds of about 3+ meters per second (about 7 miles per hour) would required to loft 5-micron dust grains on Titan. That may seem small, but the winds measured by the Huygens probe during its descent onto Titan measured even weaker near-surface winds of less than 2 meters per second. However, the study’s authors point that stronger winds probably accompany Titanian rain storms. If such a storm had just taken place before they spotted the dust cloud, that could easily explain how the dust was lofted. Ultimately, answering the question of Titan’s dust storms will require visiting the world again. Fortunately, NASA is investigating sending an automated drone to fly the Titanian skies, the Dragonfly mission, back to Titan in 2025. Whether that mission flies or not will be decided later this year. Could Solar Radiation Pressure Explain ‘Oumuamua’s Peculiar Acceleration? Posted in: BSU Journal Club. Tagged: 'oumuamua, alien life. The recent visit to our solar system by the interstellar object ‘Oumuamua has raised considerable controversy in the scientific community. Based on the fact that it is moving too fast to be trapped in an orbit around the Sun, ‘Oumuamua is the first object confidently identified as originating from outside our solar system. Its origin is unclear, and one likely possibility is that it is debris ejected from another planetary system. But Avi Loeb, chair of astronomy at Harvard, has proposed a more exciting but understandably controversial idea: ‘Oumuamua may be a probe from an alien civilization. The idea’s not as crazy as it sounds — since interstellar distances take so long to cross (with current technologies, it’s at least 20 years to *our* nearest stellar neighbor), we think aliens are likely to explore using automated spacecraft rather than sending themselves. And ‘Oumuamua did behave strangely during its short visit to our solar system. As it rounded the Sun, astronomers observed an anomalous acceleration inconsistent with the pull of the Sun’s gravity. 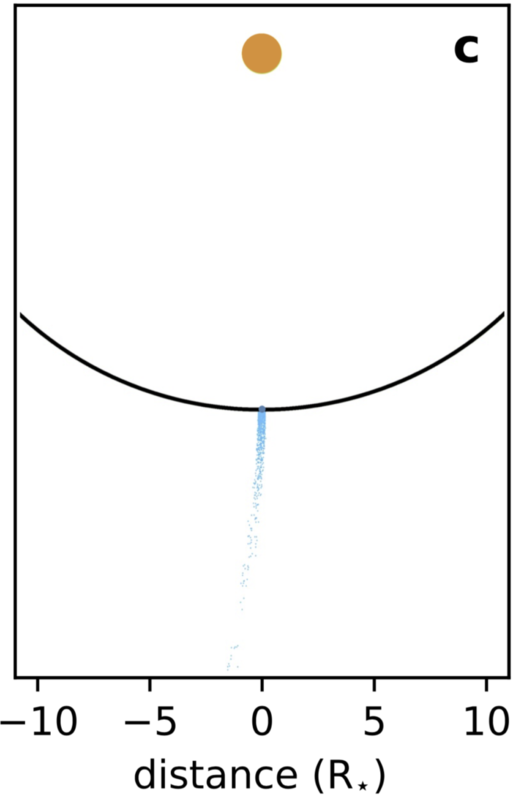 For comets, such accelerations are common and attributed to jetting from vaporizing ice. But astronomers saw no evidence for such jetting from ‘Oumuamua. 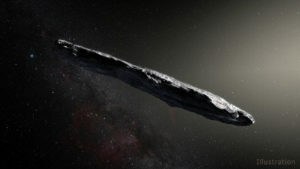 In addition, ‘Oumuamua has a funny shape, perhaps resembling a cigar, unusual but not totally impossible for a comet-like body. Loeb has explained these anomalies by proposing that ‘Oumuamua is an alien solar sail, harnessing the radiation pressure from the Sun to navigate the cosmos. Such solar sails may be a low-cost, efficient means of plying the interstellar waters and have featured in recent technology demonstrations from the Planetary Society. If ‘Oumuamua were, indeed, a solar sail, that might explain both the anomalous acceleration and the unusual shape. Fig. 1 from Bialy & Loeb (2019). 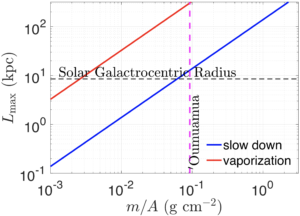 The maximum distance a solar sail can travel L_max depends on the sail’s mass-to-area ratio, m/A, but Bialy and Loeb’s calculation suggest ‘Oumuamua could safely traverse the entire Milky Way. One potential problem for is that, to work, a solar sail must be very light-weight and thin – the Planetary Society’s LightSail 2 spacecraft is a square almost six meters to a side, but weighing less than a bowling ball. It’s easy to imagine that such a cosmic tissue might not survive the rigors of interstellar travel. And so in a recent paper, Shmuel Bialy and Avi Loeb conduct a series of back-of-the-envelope calculations to argue that the interstellar rigors might not be so rigorous. One of the biggest hazards for a solar sail would collisions with interstellar dust and gas – each collision could sap ‘Oumuamua’s momentum and vaporize its surface. However, Bialy and Loeb estimate that a solar-sail ‘Oumuamua could plausibly traverse tens or hundreds of kiloparsecs before such collisions would be a problem. That means ‘Oumuamua could cross the entire Milky Way before suffering a mission-ending number of collisions. As compelling as their calculations are, my instinct (and that of most astronomers) is that ‘Oumuamua is something more mundane than an alien craft. But the conversation catalyzed by Loeb’s suggestions is probably healthy for the field of SETI, and certainly the public enthusiasm is encouraging – people love space and want desperately to find extraterrestrials. The challenge is to keep these debates firmly scientific, to strike a balance between pushing the envelope and tearing the envelope to shreds. And the line between science and pseudo-science in the realm of alien life can be as tissue-thin as a solar sail.